This July, police officers in Idaho were looking for the white van of a suspect allegedly enticing children. They approached the car of Craig Jones in the parking lot of an coffee shop. Jones, who was inside having breakfast, had left the car windows slightly open. While investigating the vehicle, Officer David Kelley became spooked, and fired his gun, killing Jones' labrador, Arfee. Kelley had reportedly approached the car with his gun already drawn, which he said was to create the "element of surprise." 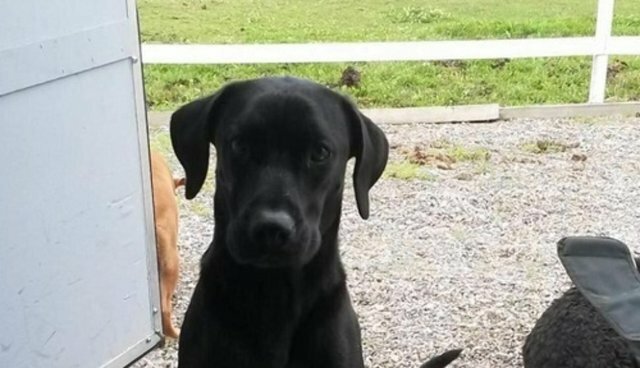 In the police report Officer Kelley described the labrador as "possibly a pit bull or pit bull mix," who was "aggressively barking and growling and its mouth was within inches of my face." Kelley stated that he had the "split second" thought that the dog would "bite (him) immediately," and that was what caused him to shoot the contained pet. But for Jones, this excuse was not good enough. "If my dog is barking and wondering who's peering through the windows, he doesn't care if you're a cop, an attorney, or President Bush. He doesn't know any different," Jones said. He has since started a Facebook page, which has over 2,500 "likes." Kelley was investigated both internally and externally and his actions were found to be in violation of the department's policy for use of deadly force. He has since apologized to Jones, who has taken the injustice to the courts. Jones and his attorney have given the city 90 days to settle, or they will file a federal lawsuit for, in part, illegal seizure of the dog. Jones is being represented by Adam Karp, an attorney who specializes in animal law. Karp is asking for $350,000 for his client, seeking compensation for "emotional distress" and "the wrecking of his life over this event." "This case is based on the value of Arfee, of course, to Mr. Jones," Karp said Tuesday. "There's also essentially the ‘psychic totaling' of the vehicle, for lack of a better description. ... So every time Mr. Jones would have to get into that van, he'd have to essentially re-enact in his mind the horror of what happened to his dog and the blood stains. Essentially it totaled the vehicle." Jones is seeking compensation for errors made by the officers, including "the potential injury to citizens" for the manner that Kelley discharged his firearm. The claim says that this possibility "does not appear to have been factored in to the decision prior to using deadly force." Karp, who has had previous victories for animal justice, including a $100,000 settlement for the family of a loose Newfoundland shot four times by a cop wielding an assault rifle, seems hopeful for his case. "Honestly, I don't think there's any dispute that this was unreasonable," he said. "Internal and external investigations both confirm."